Brushing aside the contempt proceedings initiated against him by the Supreme Court, Calcutta High Court judge Justice CS Karnan has said the proceedings are “not maintainable under law” against a sitting high court judge and asked the top court to refer the matter to Parliament for consideration. He again raised the issue of minority class and alleged that judges of higher caste wanted to “get rid of judges from SC/ST category”. Ordering Justice Karanan’s personal appearance, a seven-judge constitution bench on Wednesday took suo motu cognizance and issued contempt notice against him and also withdrew his judicial as well as administrative power for his open allegations against 20 judges of the Supreme Court and Madras High Court. “This is certainly a national issue and wise decision would be to refer the issue to the Parliament,” he wrote in the letter that was accessed by LiveLaw. “My contention is only to uproot the prevailing corruption at Madras High Court and not to spoil the sanctity and decorum of the court,” Justice Karnan took the defence and questioned the apex court’s short notice given to him for his personal appearance. Justice Karnan, former Madras High Court judge, has been in controversy for offending his fellow colleagues since 2011. 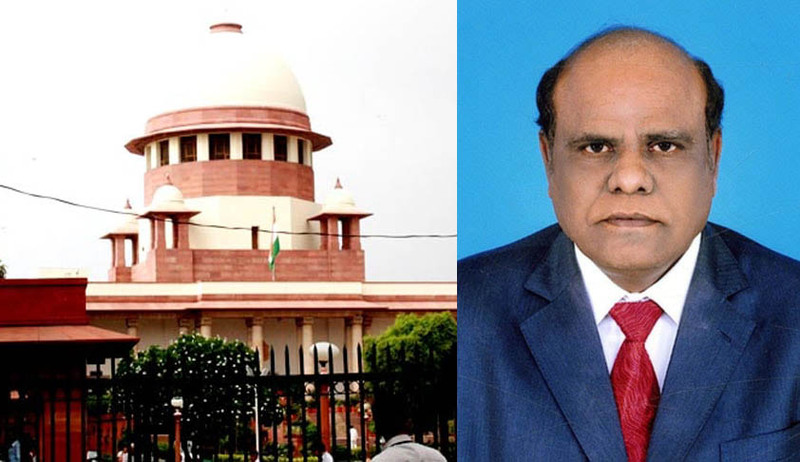 On January 21 this year, Justice Karnan had written a letter to Prime Minister Narendra Modi, naming 20 judges of the Supreme Court and Madras High Court with alleged corruption charges.